Jimmy Carter: China's Only US Ally on North Korea? Since U.S. President Donald Trump came into office, the North Korean issue has become the toughest diplomatic problem between China and the United States, as neither side sees eye to eye on the other’s North Korean policy. But China at least seems to have found one influential ally in the U.S. who appears to share the same views of North Korea: Jimmy Carter, the 39th president of the United States as well as Nobel Peace Prize laureate in 2002. In a rare move, Chinese foreign ministry publicly quoted Carter, who suggested lately that the United States should send a delegation to Pyongyang for peace talks. This suggestion is well in line with China’s proposal, as China has called for resumption of six-party talks, particularly direct dialogue between North Korea and the United States on security issues, numerous times. In particular, Carter mentioned that North Korea, led by current leader Kim Jong-un, is no longer under influence or pressure from outside, including from China. This is a point actually that has also been emphasized by Beijing in multiple occasions. Naturally, Carter’s article immediately caught China’s attention. On October 9, at the first regular press conference after the eight-day Chinese National Day holiday, when responding to Trump’s latest Twitter on North Korea, Chinese foreign ministry spokeswoman Hua Chunying fully quoted Carter’s suggestion rather than directly commenting Trump’s aggressive rhetoric. That’s no doubt significant, since it’s a rare move for the ministry to proactively cite a specific foreign person’s remarks in the press conference. While Hua did stick to China’s usual stance on North Korean issue, what’s noteworthy this time is that she appeared to have softened her tone toward the United States, despite the fact that Trump repeatedly made clear his disdain for dialogue and hinted at military actions towards North Korea recently. On China’s end, Carter’s latest article undoubtedly looks like a letter from an ally. 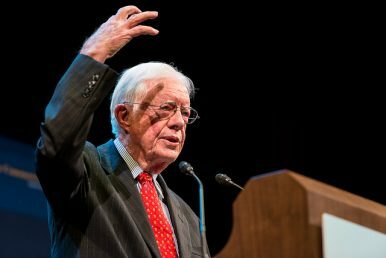 As an ex-U.S. president, Carter happened to present China’s point of view in an eloquent way toward the American people. To make matters better, Carter, despite his old age, even volunteered to represent the United States to visit North Korea and hold talks with Kim Jong-un, according to Yonhap News Agency, which cited Park Han-shik, a professor emeritus at the University of Georgia. To China, Carter would play a perfect role if his proposal comes true. Carter completed a similar task in 1994 during the Bill Clinton administration by successfully persuading Kim Il-sung (Kim Jong-un’s grandfather) to negotiate with the United States, and in the following years, Carter has been well received in North Korea. Carter also enjoys a good reputation and high popularity in China, as China and the United States established diplomatic ties during Carter’s tenure of office. In Beijing’s eyes, Carter is “the most approachable U.S. president” since he understands the situation and knows what others want. North Korea and China, Friends Again? How economic engagement with North Korea serves China’s broader strategy in Northeast Asia.